This is a post by iOS Tutorial Team Member Pablo Ruiz, an iOS game developer, and co-founder and COO at InfinixSoft. Check out his blog, or follow him on Twitter. Welcome to the second half of the tutorial series that walks you through a basic turn-based strategy game for the iPhone! In the first part of the series, we covered how to load the tile map, initialize military units (soldiers, cannons and helicopters), and how to program their movement on the tile map using the A* pathfinding algorithm. Now in this second and final part of the series, you’ll enable the units to fulfill their mission in life – make war! 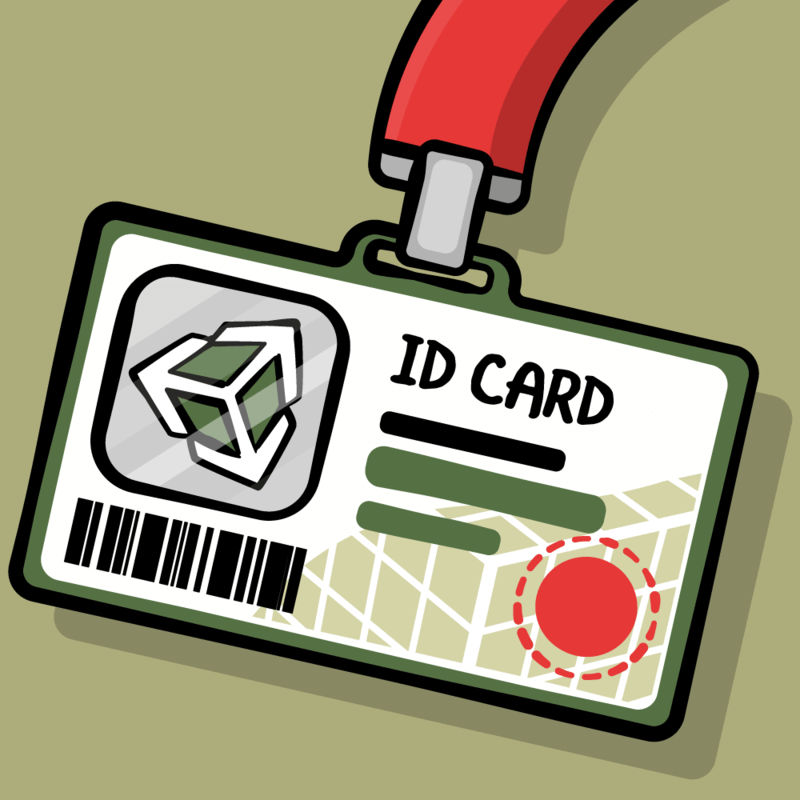 You will add buildings to the map and code multiple ways to win the game. You’ll also incorporate the logic for switching turns between players, as well as some nice finishing details like adding music and sound effects. Best of all, this project is ripe for expansion and customization so you can make your own Turn-Based Strategy game! This project starts where we left off in the last tutorial, so make sure you have the project where we left it off if you don’t have it already. Before turning to the combat portion of the game, you should spend a few minutes enriching the gameplay experience by adding a context menu. 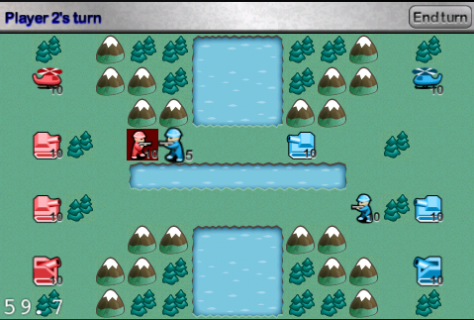 After a player has moved a unit, this menu will prompt them to choose whether the unit should stay in the new location without attacking, revert to its previous location, or, if possible, attack nearby enemy units. In the above, we’ve defined a CCMenu instance for our context menu and have also created a CCSprite instance which will point to the background for our menu. The two methods in the above code handle the creation of the context menu and the disposal of the menu when it is no longer needed. Right now the menu only lets the player cancel or confirm their movement, but it will eventually provide a third option for attacking an enemy unit. You’ll add that capability soon. // You'll determine later if there is a nearby enemy to attack. We call the showActionsMenu:canAttack: helper method we just implemented to display the context menu. Currently, the enemiesAreInRange value is hardcoded to NO and so the Attack option in the menu will not be shown. // If this is a Soldier unit and it is standing over an enemy building, the player wins. Build and run the project. You should be able to see this menu and interact with it after moving any unit. If you play with the latest build, you may notice that now, once you move a unit, you can’t move it again, ever. You may have also noticed that since you began the project, there hasn’t been any way to switch between players – you can move any player’s units at any time! While these aspects may make for a surreal and interesting game, the topic of this tutorial is, after all, turn-based gaming. 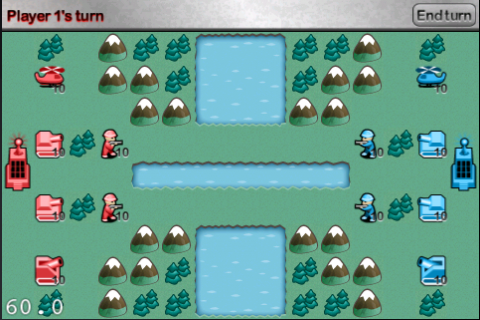 So, to stick with the program, you’ll add a HUD at the top of the screen to indicate which player’s turn it is. 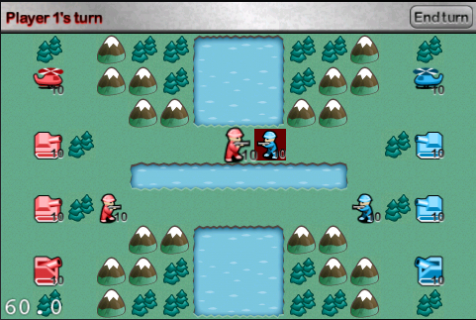 The HUD will also provide a button to pass the turn to the other player. And of course, players will only be able to move their own units during their turn. If you look at the method definitions we added to HelloWorldLayer.h and compare them against the methods we added just now to HelloWorldLayer.m, you’ll notice that we’re missing one method – activateUnits:. There’s a reason for this. The activateUnits: activates all the units belonging to the currently active player. However, we have no method in the Unit class to do this. As you’ll notice, the method gets passed the unit array for the currently active player and the method loops through each of the units in the array, activating each in turn using the startTurn method that we implemented above. Are we done? Well, almost :] The code can be built and run at this point and it would mostly work as expected. However, there’s one issue – there is nothing in the code to prevent player 1’s (or 2’s) units being selected when it’s not his/her turn since we don’t set the units not in play to deactivated status. All we do is check if the touched unit belongs to player 1 and if the active player is player 2 (or vice versa) since if the touched unit does not belong to the active player, we should not do anything. Try building and running the project now. You should see a beautiful button in the top-right corner that allows the current player to pass his/her turn. A player can move each of their units once during their turn, then the unit becomes inactive till the next turn. Soon, they’ll be able to attack as well! When you end the turn, you should see the transition effect in play. 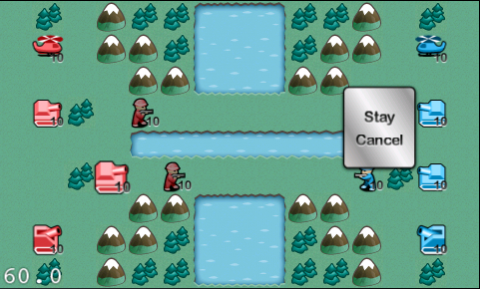 After moving a unit, if it is in combat range (immediately adjacent to an enemy unit, except for the cannon, which has a bigger range), units it can attack will be marked in red. 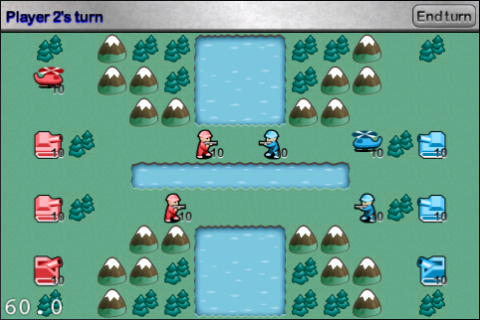 If the player selects one of the marked units, combat will be begin. The attacker unit will shoot first, and if the defending unit survives the attack, it will retaliate. The damage dealt by each unit will depend upon the types of units involved, pretty similar to a rock-paper-scissors game. (And no, the Lizard-Spock variant will not be allowed :D) Each unit type is strong against some units and weaker against others. In the above code, in section 1.3 we check tileDataArray, which is an array of all tiles displayed in the background layer, to see if any tiles are marked as selectedForAttack. But how does a tile get set as selectedForAttack? That actually happens when we call markPossibleAction: in section 1.2 but since we haven’t actually implemented the attack action till now, we have to add this functionality to markPossibleAction:. But before we make the changes to markPossibleAction:, we have to add some helper methods. Why? Because we have no way to check the board for tiles that contain an enemy unit at the moment. And as usual, when we need helper methods with an overall view of the gameplay area, we add the helper methods to HelloWorldLayer. Now that we have the helper methods in place, we can call checkAttackTile:unitOwner: from Unit objects to check each tile adjacent to the moved unit. // Is the tile not in attack range? Build and run the program. If you move a unit near an enemy unit and select “attack” from the context menu, you should see the enemy unit get marked in red. Right now, if you tap on the unit you want to attack, nothing happens. Plus, you might also notice that once a unit is selected to attack, you can’t end your turn either. Get ready to dive into the code that will handle the actual exchange of fire, damage calculation, and destruction of units (and of course, fix other issues like the one mentioned above). // 3 - Is the unit dead? Since we have all the pieces (or methods, if you will) in place for units attacking each other, we can handle an attack in the game. But first, we need to be able to determine whether we are selecting to move or attack using the currently selected unit. We already have instance variables in the Unit class for this but they weren't originally set up as properties and so we can't access them from HelloWorldLayer. So let's create the properties. // Tapped a non-marked tile. What do we do? And that's it! We're set for attacking and destroying enemy units. The final step in working out gameplay is to make something happen when there are no units left. If you remember from Part 1, this is one of the scenarios for winning. How do we check this win scenario? It's pretty simple. After each kill, the program will check if the destroyed unit was that team's last unit. If it was, the program will display a congratulatory screen and restart the game. If you're wondering why we add the call to checkForMoreUnits to section #4, and are confused because section #6 calls attackedBy: on the attacker, do note that when attackedBy: is called on the attacker, that in turn again calls dealDamage: for the attacking unit. So in this secondary run you'll be calling checkForMoreUnits again. I mentioned at the beginning of the tutorial that there would be two ways to win a game: by eliminating all units from one of the teams, or by having a soldier unit capture the other player's HQ. It's time to implement the latter scenario. First, add a new class, Building, which will be the base for other buildings. In this tutorial you'll create a simple HQ, but you can use the same technique to create other types of buildings to make your gameplay more interesting. Add Building.h and Building.m to your project by creating a new file with the iOS\Cocoa Touch\Objective-C class template. Name the class Building, and make it a subclass of CCNode. As you can see, the code is pretty simple and not that different from how you started the Unit class. Now, you need to create the Building_HQ class that will be a subclass of Building. Add Building_HQ.h and Building_HQ.m to your project by creating a new file with the iOS\Cocoa Touch\Objective-C class template. Name the class Building_HQ, and make it a subclass of Building. The HQ class too is really simple. It doesn't do much more than just standing there. Now that we have the building classes in place, we need to add building for both players. Do note that the logic for buildingInTile: always returns the first building that it finds on a given tile. This could be an issue if two buildings existed on the same tile but since that's not how our game works, this is not something we have to worry about. // Is there a building? // Is the building owned by the other player? That's it! Compile and run the project, and you should see the HQs appear on both sides of the screen. Try moving a soldier unit onto the enemy's HQ. The game should end at that point. You're almost done with the project. Let's add some music and sound effects to jazz things up and you're set! In case you're curious, I got the music from Incompetech.com and made the sound effects with CXFR. Finally, let's add some sound effects for various events such as units being attacked or buttons getting pressed. And that's it - we're done! 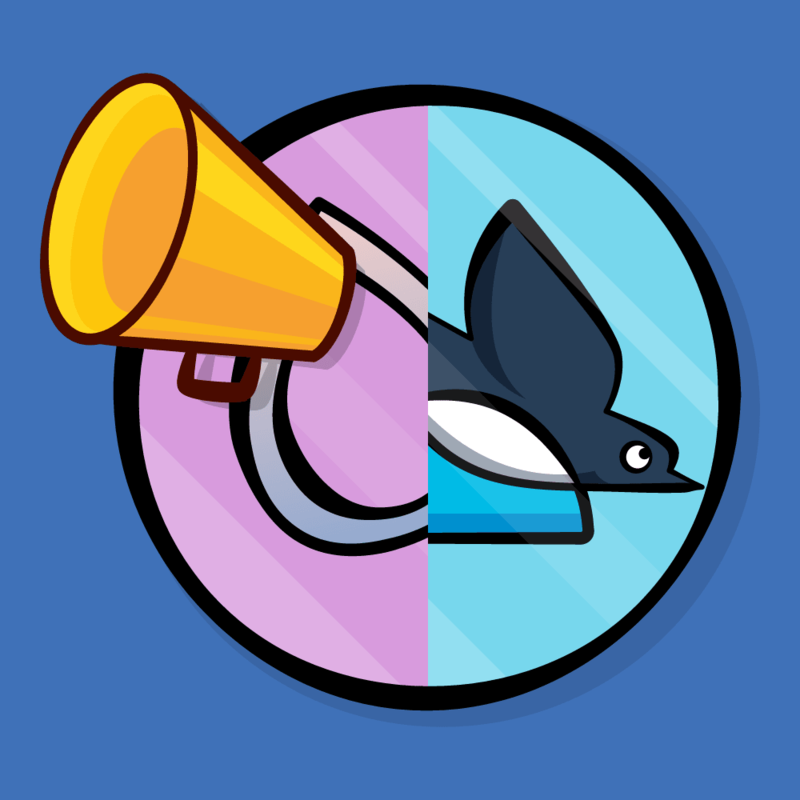 Build and run the game now, and you should be able to hear all of the music and sound effects. Mission Accomplished! Looks like you now have a working turn-based strategy game. Here is the final sample project with everything this tutorial has covered. How about adding new, more interesting units? For example, ships that can only move in water, units that can carry soldiers, and medics/mechanics that can heal other units? You could add other types of buildings, like a factory that can build new tanks using some currency, or a hospital. Why have just one map? How about creating new maps players can choose from with other terrain types, or with things like traps, destroyable obstacles, etc.? You could completely change the theme. How about going medieval? Or using a sci-fi theme with alien units? I'd like to hear about any other ideas you have to improve or modify the game, and your experiences working with this tutorial, so head over to the forums to leave your comments. And happy coding!